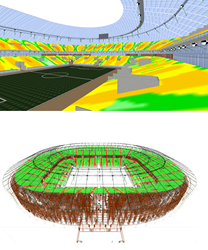 iBwave, the global standard for designing multi-technology in-building networks announced today that MTS, the leading telecommunications group in Russia, has successfully used iBwave Design to plan, design, deploy and manage modern high density and high capacity wireless networks for the 2018 Soccer tournament. “It is always difficult to predict mobile consumer needs in high density, high capacity environments- particularly for a world class sporting event such this, where thousands of sports fans are simultaneously using multiple devices across multiple technologies,” says Seth Roy, Vice President Product Line Management at iBwave. “Based on our experience of connecting major sporting events such as past World Cups and the Olympics, our tools are the ideal choice to prepare for the huge amounts of data requirements during the 2018 World Cup. We are proud to support MTS in this project and extremely excited to be part of the design and deployment of Europe’s largest Massive MIMO experiences,” he added. More than 3 million spectators are estimated to watch the games live during this month-long event, which is underway until July 15. For more information on iBwave and its solutions visit: iBwave.com.